Scorecarding, made popular by Kaplan and Norton and the Balanced Scorecard Consortium, is still seen as an executive or senior management tool. Stories abound of scorecarding projects which fail to deliver tangible benefits or are only implemented a couple of levels down in an organisation. That doesn’t need to be the case. Often the block to effective scorecard implementations is identifying the correct KPI’s. We all know that “you get what you measure”, hence the reluctance to roll-out scorecards to a wider audience without confidence over the choice of the KPI’s. Chosing the correct KPI’s at every level in the organisation requires an intimate understanding of the operation of the business. Nimbus control-ES provides that process context. an integrated Performance Management solution. Metrics, processes, roles and responsibilities are all presented in one coherent picture which everyone in the business can access and understand, with an auditable history of all changes. However, we understand that with many projects, pinpointing Key Performance Indicators is still the easiest way of engaging senior management. Therefore many project start with just scorecarding, which is why we implement Microsoft Business Scorecard Manager 2005 in standalone projects where control-ES is not implemented. What are the four perspectives of the Balanced Scorecard? What kind of benefits can I get off the Balanced Scorecard? Breaking down strategic measures towards lower levels, so that unit managers, operators, and employees can see what’s required at their level to achieve excellent overall performance. This perspective includes employee training and corporate cultural attitudes related to both individual and corporate self-improvement. In a knowledge worker organization, people are the main resource. In the current climate of rapid technological change, it is becoming necessary for knowledge workers to learn continuously. Government agencies often find themselves unable to hire new technical workers and at the same time is showing a decline in training of existing employees. Kaplan and Norton emphasize that ‘learning’ is something more than ‘training’; it also includes things like mentors and tutors within the organization, as well as that ease of communication among workers that allows them to readily get help on a problem when it is needed. It also includes technological tools such as an Intranet. In traditional industrial activity, “quality control” and “zero defects” were important words. To shield the customer from receiving poor quality products, aggressive efforts were focused on inspection and testing at the end of the production line. A problem with these approaches – as pointed out by Deming – is that the true causes of defects could never be identified, and there would always be inefficiencies because products with a defect are rejected. Deming understood that variation is created at every step in a production process, and the causes of variation need to be identified and repaired. If this can be done, then there is a way to reduce the defects and improve product quality indefinitely. To establish such a process, Deming emphasized that all business processes should be part of a system, with feedback loops. The feedback data should be examined by managers to determine the causes of variation, and what are the processes with significant problems. Then they can focus their attention on repairing that subset of processes. 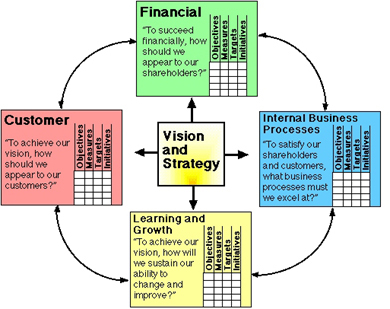 The balanced scorecard method includes feedback around internal business process outputs. As in TQM. 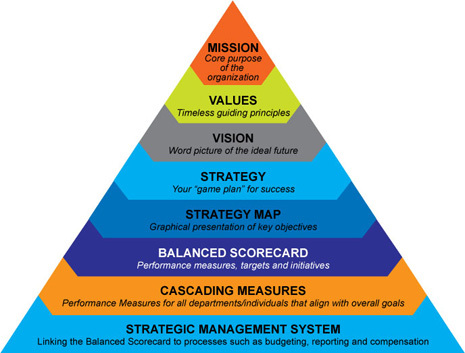 Additionally, the Balanced Scorecard provides a feedback for the outcomes of business strategies. This creates a “double-loop feedback” process in the balanced scorecard. What kind of Outcome Metrics? You can’t improve what you can’t measure. Therefore metrics must be developed based on the priorities of the strategic plan, which provides the key business drivers and criteria for metrics managers most desire to watch. Processes are then designed to collect information relevant to these metrics and reduce it to numerical form for storage, display, and analysis. Decision makers examine the outcomes of various measured processes and strategies and track the results to guide the company and provide feedback. Strategic feedback to show the present status of the organization from many perspectives for decision makers. Diagnostic feedback into various processes to guide improvements on a continuous basis. Trends in performance over time. Feedback around the measurement methods themselves. Which measurements should be tracked? Quantitative inputs for forecast methods and for decision support systems. You tend to get what you measure. People will work to achieve the explicit targets which are set. For example, emphasizing traditional financial measures may encourage short-term thinking. The Core Group Theory by Kleiner provides further clues on the mechanisms behind this. Kaplan and Norton recognize this, and urge for a more balanced set of measurements. But still, people will work to achieve their scorecard goals, and may ignore important things which have no place on their scorecard. In 2002, Cobbold and Lawrie developed a classification of Balanced Scorecard designs based upon the intended method of use within an organization. They describe how the Balanced Scorecard can be used to support three distinct management activities, the first two being management control and strategic control. They assert that due to differences in the performance data requirements of these applications, planned use should influence the type of BSC design adopted. Later that year the same authors reviewed the evolution of the Balanced Scorecard as shown through the use of Strategy Maps as a strategic management tool, recognizing three distinct generations of Balanced Scorecard design.